National Hispanic Heritage Month celebrates the history, culture, and contributions of Hispanic and Latino Americans from Spain, Mexico, the Caribbean, and Central and South America. In the United States, Hispanic Heritage Month is observed each year from September 15th to October 15th. Hispanic Heritage Month first began as Hispanic Heritage Week. The week-long commemoration was first established in 1968 by president Lyndon Johnson. Later, in 1988, president Ronald Reagan expanded the celebration to a 30-day period, known as Hispanic Heritage Month. September 15th was elected as the official start date of Hispanic Heritage Month because it marks the anniversary of independence of five Latin American countries: Costa Rica, El Salvador, Guatemala, Honduras and Nicaragua. In addition, Mexico, Chile, and Belize celebrate their independence on September 16, September 18, and September 21, respectively. During Hispanic Heritage Month, we recognize the Hispanic men and women who have made significant contributions to the fields of politics, science, art, sports, and more. The following list features notable Hispanic figures throughout history. Roberto Clemente – Puerto Rican professional baseball player and hall of famer. Roberto Clemente was the first Latino player to collect 3,000 career hits as well as being the first Latino inducted into the National Baseball Hall of Fame. Clemente used his platform to advocate for equitable treatment of Latino baseball players. Off the field, Clemente was well known for his humanitarian work. Rita Moreno – Puerto Rican actress, dancer, and singer. Rita Moreno is best known for her role as Anita in West Side Story. This role earned Moreno the Oscar for Best Supporting Actress and made her the first Latina to win that honor. Moreno is one of few artists to have won all four major American entertainment awards: the Oscar, the Emmy, the Grammy, and the Tony. Cesar Chavez – Mexican-American union leader, labor organizer, and civil rights activist. Cesar Chavez dedicated his life to improving working conditions for farm workers. In 1962, Chavez founded the National Farm Workers Association. His union joined the Agricultural Workers Organizing Committee to strike against grape growers in California. Chavez led marches, boycotts, and hunger strikes to bring attention to his cause. Carlos Santana – Mexican-American musician. Carlos Santana is an award-winning guitarist and leader of the band Santana. Santana’s music is categorized by its blend of Latin, rock, jazz, and blues sounds. Santana has won 10 Grammys and three Latin Grammys. Ellen Ochoa – American astronaut. Ellen Ochoa became the world’s first Hispanic woman to travel into space. In 1990, Ochoa was selected by NASA to participate in its astronaut program and in 1994, Ochoa served as mission specialist aboard the shuttle Discovery. Ochoa currently serves as director of the Johnson Space Center. Selena Quintanilla – Mexican-American singer and songwriter. Selena Quintanilla, known as the “Queen of Tejano Music,” is credited for catapulting the Tejano music genre into the mainstream market. In 1994, Selena’s work earned her a Grammy in the Mexican-American album category. Sonia Sotomayor – American associate Justice of the U.S. Supreme Court. In 2009, Sonia Sotomayor became the first Latina Supreme Court Justice in U.S. history. She is known for her rousing dissents on issues of race, gender, and ethnicity. Celebrate Hispanic Heritage Month in your classroom with our teaching resources. 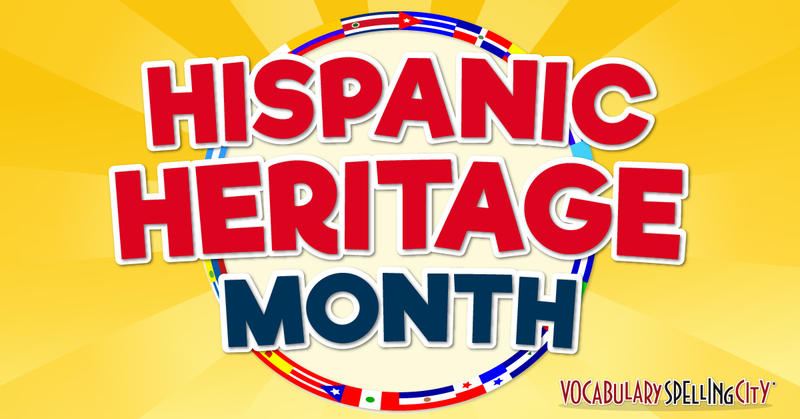 Supplement a Hispanic Heritage Month lesson with varied word lists on prominent Hispanic figures and Hispanic countries. Pair these, and other monthly holiday spelling lists, with interactive games and activities to provide extensive vocabulary practice.